THE PONTIFF HAS BEEN CHOSEN AND MY FAITH RESTORED! DOUBT has entered man from time to time! As the world evolves, population expands and civilization becomes more advanced (advanced can sometimes be questioned) and the volatility of FAITH around the world and especially the United States, one has to be thankful that we have a POPE who represents attributes that even among the clergy are rare. I say “we” because he is a world leader and I make no assumptions about people’s religion or belief in Christianity. It was 12:20 p.m. on Wednesday afternoon March 13, 2013 that I stopped my daily yard cleaning routine as I was watching the arrival of the new POPE. His physicality sense of self was evident to the cameras around the world. The words expressed by the reporters were of immediate interest to me and I did not have to be convinced that this was the MAN to lead not only the Catholic Church worldwide, but could relate to the simplest or most complicated of men around the world. “He is known to ride the bus and make his own meals”…”turned down all the perks that came with his former job as a Cardinal.” When I heard those words, I listened more intently and my eyes crystallized as I was seeing the POPE and the massive crowd I am sure made up of Catholics and non Catholics. The smiles, tears and faces expressing ultra joy transmitted to me a message of HOPE! As Pope Francis began to speak he used common language and he said that the cardinals had selected a person from far away; meaning far away from the Basilica and Rome. Within seconds he engaged the crowd by blessing the crowd and the world and invited the public to pray “El Padre Nuestro” “The Lord’s Prayer” followed by an “Ave Maria”… and immediately he asked the crowd to pray for him. The simplicity of his message did not leave anyone wondering about our new POPE’s first priority. Argentina status in the world has been enlarged by a man who will follow the footsteps of St. Peter; our first selected leader chosen by GOD to spread his message and serve the human race. 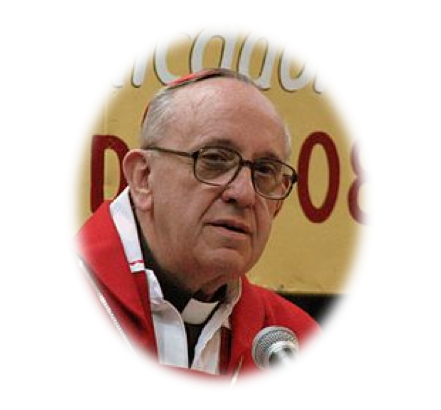 The man from Argentina selected the name of FRANCIS to replace his lifetime name of Jorge Bergoglio; henceforth, PAPA FRANCIS will be his NAME around the world! The WORLD has now a SHEEPHERDER of sheepherders and will lead his flock to strengthen our Faith and our Human Race; LAS AMERICAS have been blessed to have a POPE from this part of the world for the first time in Catholic History.